My Competitors Are Posting Fake Reviews! Great! You’re just getting traction with your fishing guide business when your competitors start to take notice and bash you on social media. Bad news. Right? Well, on one hand, there is a very good reason they are pulling the pin on a grenade and lobbing a bad review in your direction. It is most likely because you’re fishing daily…and they’re not. On the other hand, potential customers are going to see the negative review and it will hurt your reputation. 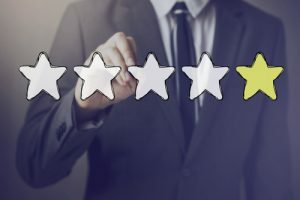 Most customers aren’t savvy enough to understand the reputation management game or thought process behind a negative review, especially a FAKE review seeded by a competitor. Just like a positive review, you will need to respond to the negative review immediately and in detail. When writing your response, keep in mind that the WORLD will read your rebuttal. DO NOT get down in the mud with your competitors. (Remember the old saying: Never argue with an idiot: They’ll drag you down to their level and then beat you with experience.) Instead, take the high road and kill them with kindness. Here is an actual review that was blatantly left by the competitor of one of my guides. These guys are awful. They charged my credit card double and we never caught any fish. I highly recommend you stay away. Total Rip off! I’m sorry you had a bad experience, however are you sure it was with us? We have no one in the books by “John Competitor” and I have a close relationship with each customer that we fish with. And we certainly have never charged a customer double. It is important as a charter captain that all our customers have the best adventure possible. While I am not sure who you have possibly fished with, I recommend you check your credit card statement for the business name and follow up with the captain. It is stories like this which is why we try to educate our customers before booking a trip. Please check out our “Why us” page for more information. Again, I’m sorry about your fishing experience and I do hope you find a resolution. If you would like to go fishing with us, please contact me directly on my cell phone at 954-123-4567 and I’ll be happy to fill you in on what’s biting and what you can expect to catch. While we can’t guarantee fish, we can guarantee you will receive a top of the line captain and mate that will exceed your expectations. Now, put yourself in the shoes of a potential customer who is researching guides by reading reviews posted to Trip Advisor or Google. Human instinct after reading such a review is to immediately look for your response to see how you handle yourself. Your character is revealed in times like this. Make it work to your advantage. Trust that this response formula works every time and we have even had customers ask why we have competitors leave fake reviews. After responding to the review, be sure to report it as well. Trip Advisor and Yelp have a staff that will review the post and, in many cases, take action to remove the review and possibly ban the party responsible for the review. Such shenanigans could weaken the Trip Advisor or Yelp brand. Therefore, their response will be faster than a bull shark on tuna carcass. HOWEVER, in contrast, Google is a major player in the reputation industry but basically provides no response to complaints like the aforementioned scenario. You can report the review at this LINK, however we rarely see the reviews removed. It is unfortunate, but I think Google will get to the point to where these reviews are better managed. So, hang in there. In the meantime, keep encouraging the positive reviews to keep your ratings up and push your competitor’s malicious reviews down the page – and into your rear view mirror. Your competitor will soon grow weary of bashing you online and move on. Your competitor will soon realize that his efforts backfired by increasing your review count – even though they are negative (and fraudulent) reviews. For more strategies on how you can protect your reputation and book more charters please VISIT ChaterFishingBusiness.com now available in a hard copy shipped to your door step.